Sample amazing global eats from 7 exclusive local vendors – like Shanghai-style noodles, empanadas, Colombian hot dogs, summer rolls, rendang curry, ice cream sandwiches, and more. All to the beat of a live DJ set in downtown Manhattan’s coolest event space located on the edge of Nolita. 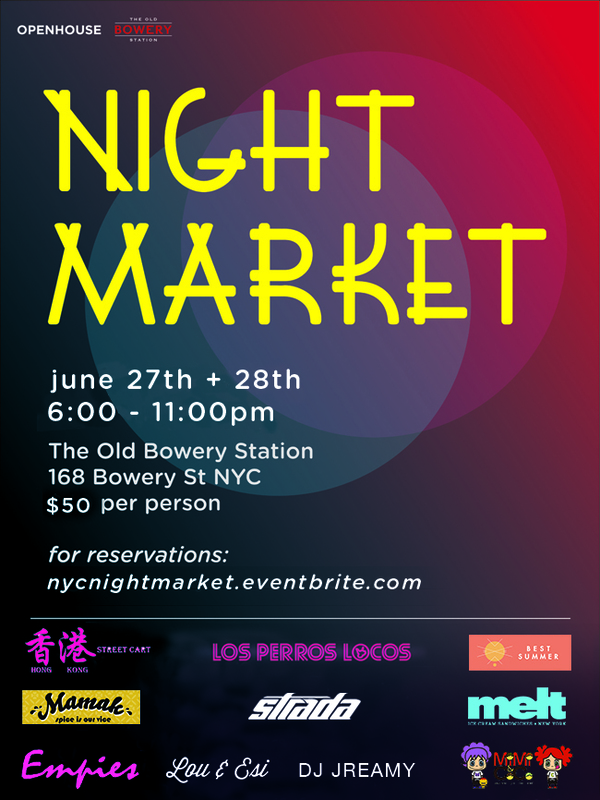 Join us June 27th and 28th from 6 to 11pm at The Old Bowery Station on the corner of Bowery and Kenmare. Tickets are $50 and include 9 tastings and 2 alcoholic beverages. Additional drinks can be purchased at the bar. No refunds, exchanges or changing time slots. This entry was posted by Rosemarie on Thursday, June 20th, 2013 at 7:16 am	and is filed under Events, Lower Eastside, Manhattan, Nolita, Soho. You can follow any responses to this entry through the RSS 2.0 feed. You can leave a response, or trackback from your own site.